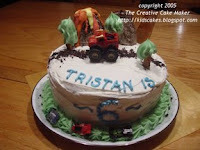 The Creative Cake Maker: "I want Mountains, Trucks and Trees"
"I want Mountains, Trucks and Trees"
"I want Mountains, Trucks and Trees!" That is the response I got when I asked my son what he wanted on his cake for his 6th birthday. I'm lucky he said what he did. I already had a round 2-layer cake baked and iced. All I had left to do was decorate. I had to think fast of things in the house that could possibly be turned into "Mountains, a Truck and Trees". While I pondered the possibilities, I made the road...a truck has to have a road, doesn't it? It's made from oreo cookie crumbs. I just happened to have some in the cabinet for making pie crusts. The truck was easy. I just washed one of my sons trucks. The trees...well, I has some pretzel sticks left over from making my chocolate dipped pretzel sticks for the holidays. I just piped icing onto them and they became trees! Doesn't it remind you of the Lorax? Looking at them now, I think if I ever need to make a Dr. Seuss cake, I'll make the trees the same way except I'll use pink, orange and blue icing. As for the mountains, I had some ice cream cones in the cupboard that I covered with brown icing and cookie crumbs. Then I decided to go one step further. I colored small amounts of icing red, orange and yellow and melted them down. Once melted (just until pourable) I poured the icing on one of the mountains letting it run down the sides. First with the red, then the orange and finishing up with the yellow. Ta-daaa! A volcano! Hey, the kids recognized it as a volcano and they all wanted THAT part of the cake. So, if you look around, you can surely find something already in your kitchen that will make a great cake and make a child very happy.